Kim Hill is the artist behind CG Essentials. She is a professional photographer and self-taught digital artist who started designing digtally in 2002 when her oldest was a newborn. She set up her first shop in 2004 and has been designing products for her photography business as well as for scrapbooking her own family photos. Most digiscrap kits are 100% digitally created, but some of the more recent kits include items which Kim has photographed and then extracted in order to offer more "realistic" items for those who enjoy them. GoneDigital offers high quality 12x12 digital paper packs, realistic clip art and affordable digital collage sheets for traditional and digital scrapbooking, paper crafting, card making and whatever else springs to mind. With free printables available each month from the GoneDigital blog, you’ll find plenty of beautiful and unique designs to inspire your own projects. 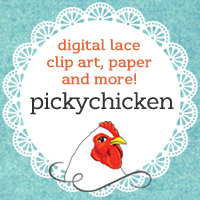 Available for personal and small commercial use, ideal for the independent crafter and small businesses. Return customers automatically receive a 15% off discount code. I have been Drawing for years now. I Love to create things. I Started out in the Pixel world on the Internet, but fell in love with the more printable type of graphics. I always seem to design Fun and Kid Graphics. But have many Choices in my designs that can be used many ways.